The book begins with the gruesome murder of Santiago Nasar. Incidentally, the murder had taken place a good 27 years earlier and the narrator is trying to comprehend the events that led to the crime. Soon, we come to know that Angela Vicario, a poor man’s daughter and Santiago Nasar’s neighbor is married off to a foreigner Bayardo San Roman. On their wedding night, Bayardo San Roman silently brings back Angela Vicario to her house because she is not virgin. An embarrassed mother and agitated twin brothers questions Angela who deflowered her. She takes Santiago Nasar’s name. The twins, Pedro and Pablo, carry knives… sharpens it at a butcher’s shop and announces to everyone around that they are going to kill Santiago Nasar. Some people don’t believe, some don’t understand, some decide to let Santiago Nasar know and some just forget due to the excitement caused by Bishop’s visit to bless the newlyweds! The beauty of the story is that everyone - the entire village - knew about the death. Nature also warns and Santiago Nasar’s dreams also sends messages. Yet, nobody could stop the death. The incident affects the villagers so much that they fail to forget it even after 27 long years! What I loved about this book is its narrative style. It is brilliant. It tells you the end first and then goes on a reverse gear, describing the details. Most of the book talks only about what people remember about that incident. But, the climax ghastly narrates how he was stabbed and killed. The plot is honor killing of course which is relevant even today. This book was written in 1981. However, this book is also about several other intricate details like revenge, Chasity and the big gap between rich and poor. 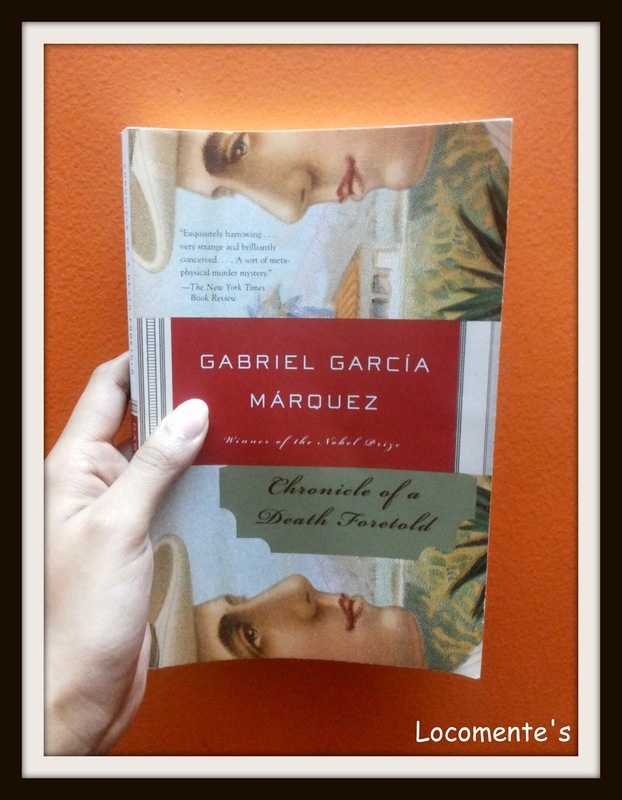 As the book ends, it still makes you wonder if Santiago Nasar was really responsible in deflowering Angela Vicario? If it is not, who was responsible and why did Angela Vicario take his name? Did the twins kill because they were really angry or were forced to kill as the whole village knew about it? Why did Angela Vicario longed to get back her husband? How did she feel about the murder of Santiago Nasar? In short, this book is gripping and makes the reader think. It makes the reader to raise question and find answers themselves. Or does the book implies that nothing really ends? You will not regret those couple of hours spent on it! PS: It was really unnerving to learn that the story is based on a real-time incident that occurred to the author knew! My cousin for briefing the story… arousing the interesting… and lending her book for a couple of hours!!! ü "He was healthier than the rest of us, but when you listened with the stethoscope you could hear the tears bubbling inside his heart." ü "They’re perfect,” she was frequently heard to say. “Any man will be happy with them because they’ve been raised to suffer." ü "She would go to sleep only once and that would be to die." Garcia's story plots are really different and amazing. I read a few of his book and they were really nice. The story seems interesting but reminded me of Draupadi's 'cheer-haran' case from the Mahabharata where everyone stays mum for reasons of his own.